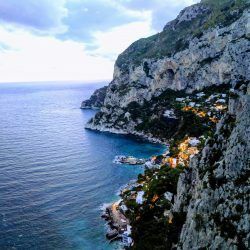 Capri, Italy! Capri is an island off the coast of Naples. 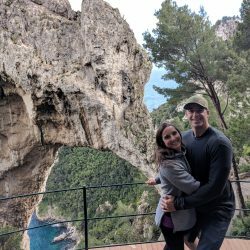 I hadn’t been to Capri since I studied abroad in 2001 and it was exactly how I remembered! (from what I actually remembered lol). We were only there for two nights and one full day and made the most of it. I think 2 days in Capri is sufficient. 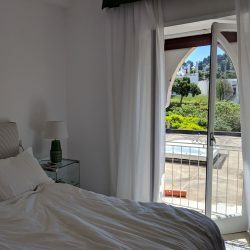 You can also take day trips from Positano, Sorrento etc but I suggest booking one night so you get an entire day/night to see the majority of it. Keep reading for all the fun things to eat, see and do OR watch my YouTube Video by clicking here or scrolling down to the bottom! 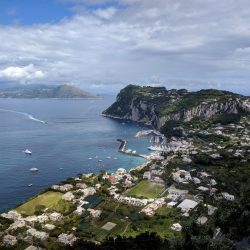 The easiest way to get to Capri is fly into Naples airport and take a cab to the dock (either Mollo Beverello or Calata Porta di Massa depending on the time you land). Click here for the Ferry Schedule. We took a cab to Mollo Beverello for 21 Euro and it took about 25 minutes. HOT TIP #1 – negotiate the price with the cab driver in advance! HOT TIP #2 – don’t let the cabbie try to say there’s too much traffic in that area and you need to pay 6 more euro after the fact. Stand your ground and don’t let them take advantage of you! When you get to Mollo Beverello (or the other port) head to the ticket window. Our one way tickets cost 21.50 euro + 2 Euro for our carry on luggage per person. We were heading to Sorrento from Capri so that is why we only bought one way. We were on the high speed ferry which takes 50 minutes from the port. 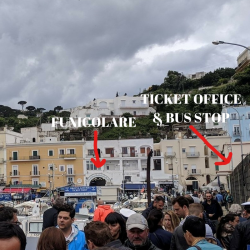 When you get off the boat in Capri walk to the ticket counter (down the dock and make a right – see 2nd image below). You can either take the bus to Capri or Anacapri OR you can take the Funicolare to Piazza Umberto (Piazzetta) which is the center of Capri. 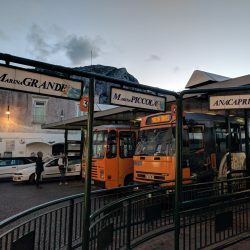 If you are heading to Anacapri it might be easier to hop on the bus right next to the ticket counter rather than taking the funicolare up to Piazzetta and then taking a bus to Anacapri. The Funicolare costs 2 Euro for a one way and is a fun little ride! The bus cost 2 Euro and takes a weee bit longer. To get around Capri you either walk, cab (never! ), bus or funicolare. There is another bus station right next to Piazzetta) that takes you up to Anacapri for 2 euro. 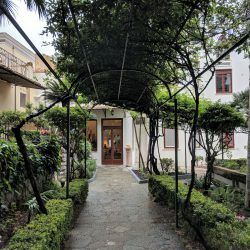 We stayed right off the city center in Capri at Hotel Villa Helios. It was a great little hotel with free wifi and breakfast and friendly hotel staff. The room was a tiny but we weren’t really in it that much. The shower was SMALL but in reality all of Europe has small stand up showers. I was fine but my 6’2 husband has a weee bit of difficulty LOL. 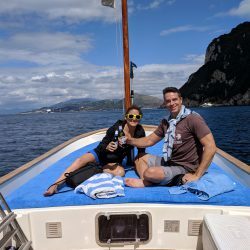 If we did this trip again I would definitely stay in Anacapri. Capri is more high end and if you know me… I am a lot of things, but high end isn’t one of them. Anacapri had more shops and restaurants “for the people”, whereas Capri was filled with Gucci, Todds, and other expensive (albeit beautiful) stores. #1 90% of the restaurants close from 3-7. So fill your belly with food before 3pm so you can make it until dinner. #2 Everything is discounted for locales. So if you’re wondering how these little old Italians afford to live on these expensive islands, just know that the cappucino that costs you 5 euro is only 1 Euro for them! #3 There is a Coperto (cover charge) to eat/drink everywhere. It is usually 1.50 Euro per person to sit and dine. #6 Take a 2 hr boat ride around the island around 3pm. That way by the time you get to the Blue Grotto you can hop off the boat and swim in for free! 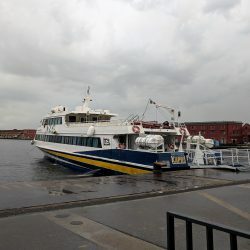 If you go earlier you will have to pay to transfer to a smalller boat to ride in (no swimming allowed before 4:45ish). See more info below. I don’t know why I have this section in my blog because I don’t do nights. I am an early bird and love to seize the day. At night I turn into a pumpkin and fall asleep as soon as the clock strikes 10pm. We did ask one of the waiters at a restaurant what there was to do at night and he said nothing. He said it’s too expensive to live on Capri in general (unless you are a local) so no one does much of anything. BEER: There is a lot of Peroni in Italy. Shocker right? LOL. There is also Nastro Azzuro lager everywhere as well. We drank more wine than beer in Italy but these were our two go-to’s when we were out and about or playing games in the hotel. Buy beer/wine at the local market/convenient store and bring it to the beach, boat, picnics etc. WINE: Fantastico! Even the cheapest of wine on Capri is smooth and delicious! We always opt for the house wine when dining out because it’s the cheapest and tastes great! We also bought quite a few bottles at the store to play games in the hotel room and found that Aglianico is the cheapest (about 6 euro) and is delicious! COFFEE: I am not a strong coffee drinker so when I travel I usually stick with Cappucino’s and Lattes so that the milk tones down the strong espresso. 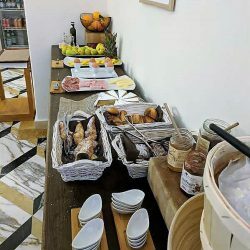 They were consistent and delicious at the hotel breakfast and anytime we needed a pick me up. There are coffee shops all over the place so it isn’t hard to find a great cup of coffee. Random storefronts – pop into any random bakery that you see and try something out! Usually those places are cheap and you can get a good little calzone or pastry for the road! 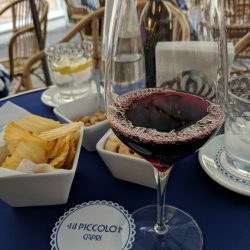 Il Piccolo – Capri (Piazzetta) – This is in the heart of Capri and because of that it’s a tourist trap. That being said, it is fun to sit and people watch. We bought an overpriced half bottle of wine and sat for a bit while we waited for the dinner places to open up. Thankfully the overpriced bottle came with 3 small snack bowls. That was a nice touch! 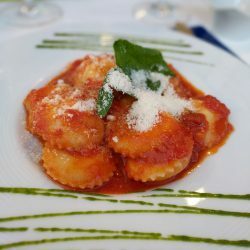 La Capannina – This dinner was delicious! We stalked them at 6:58 to let us in and we sat right down (early bird gets the worm!) I got the Pasta bolognese (delicious! not much meat though – this is a common theme across Italy) and Hancy got the seafood pasta with scialatelli pasta. We also got a 1/2 carafe of the house wine for 9 Euro…. That my friends is CHEAP! Overall dinner cost 60 Euro. Not good, but not bad. 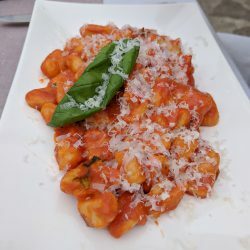 L’Angolo del Gusto – Anacapri – This lunch was deeeelicious! 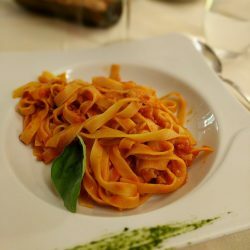 We ate this after wandering around Anacapri all morning and it hit the spot! I devoured the lasagna and Hancy mowed the gnocchi. The house wine was fantastic too. This too was about 60 Euro so it was defnitely and expensive lunch but filling and on par with the rest of the Capri/Anacapri pricing. D’Amore – Capri – This was right down the street from our hotel and they had a special deal for Villa Helios guests so we checked it out. 3 courses for 35 Euro per person. (wine and water not included however they didn’t charge us a coperto). It was ok. I wouldn’t go back. The only course that I loved was the ravioli. Meh. Skip it. 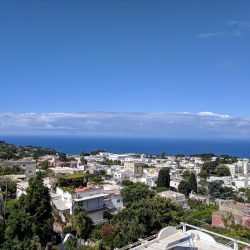 Anacapri – If you are not staying in Anacapri then definitely take the bus from Piazzetta to Anacapri. It is 2 Euro one way. Walk around, browse the shops, have lunch. (see next for why to buy one way). This is a MUST DO. 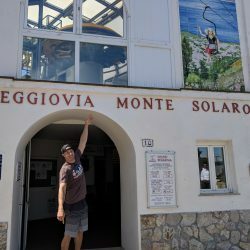 Monte Solaro & Chairlift – Go to Anacapri in the morning and get off the bus in the main area. Head up the stairs to Monte Solaro to beat the crowds. 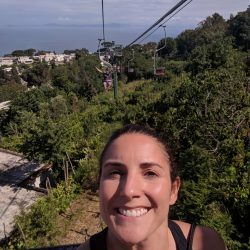 To get to the top of Monte Solaro you take a one person chairlift that gives you amazing views of Capri while you ride to the top (for more amazing views). We bought a round trip chair ticket for 11 Euro each and they didn’t even check the ticket on the way down! It’s up to you whether you want to buy one way and risk it or not, LOL. This is a MUST DO. 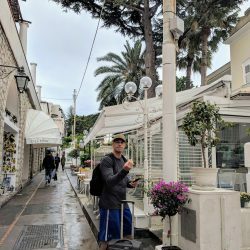 Walk from Anacapri to Marina Grande – If you are fit and like to walk I suggest taking the bus up to Anacapri, sightsee, eat etc and then walk down to Marina Grande (dock area). It has stunning views but you do need to be in shape! There are a TON of stairs. 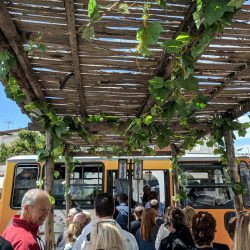 To do this walk you literally walk by the bus station (leaving Anacapri) and eventually there will be stairs that you go down (and go down, and go down….). 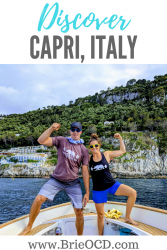 Time it so when you get to the bottom you can hop on your 2 hr boat tour around Capri! 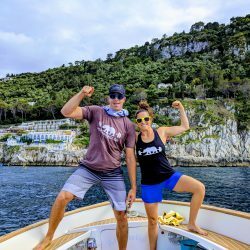 2 Hr Boat Tour – Hire Capri Island Tour and take a 2 hour boat ride around Capri. You sail through I Faraglioni, the different grottos and most importantly the Blue Grotto! 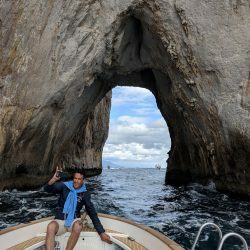 Go at 3pm (after you went to Anacapri, lunch and the walk down to marina grande) so that by the time the boat loops around to the Blue Grotto you can hop off the boat and swim into the grotto. Once in a lifetime experience! (see Hot Tip # 6 for more info). The boat ride cost us $140 Euro through our hotel but I think it would be about the same if you booked with them direct. We had Antonello as our guide and he was great! There are two other drivers for this company that speak English however Antonello was limited in that respect (we were fine with that). This is a MUST DO. 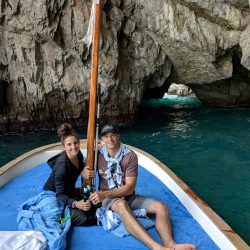 Blue Grotto – You must go see the Blue Grotto while in Capri! I suggest starting the boat tour mentioned above at 3pm so that you can actually swim inside the grotto! Anytime before 445ish you cannot swim. Instead there are smaller boats that will take you inside the grotto for a fee. You can take your beverage of choice on the boat so prepare in advance and head to a local market to buy beer/wine and not to a restaurant. Arco Naturale – This was acutally the first thing we walked to when we arrived in Capri. A nice little walk from our hotel and the arch was beautiful. Nice for a photo opp and move on. 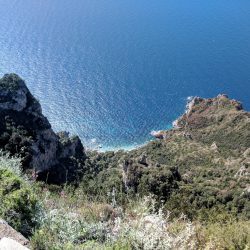 Belvedere Punta Cannone – We walked here right after dinner in Capri. You can take the stairs across from the bus stop in Piazzetta and hike a little bit (there are signs) to see amazing views of the city. Cooking class – Unfortunately we did not take a cooking class but I wish we had! 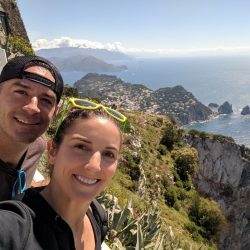 If you have time I suggest looking up a great cooking class in Capri! There are a ton of other gardens and places to visit however if you aren’t there for much time I suggest starting with the things above. 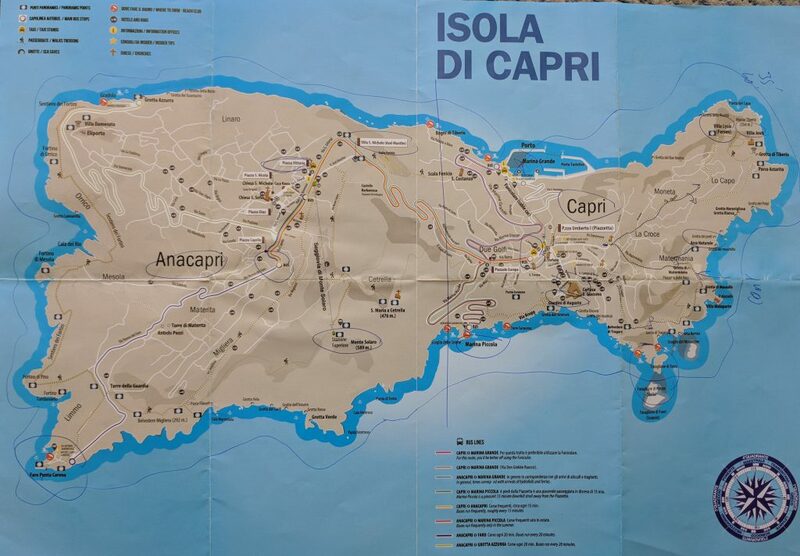 See map below for other great things to do in Capri if you have more time! One place I have not been yet, at least I don’t think so but it is so gorgeous. It is a must do on my list.